The pigments of the iris petals create the brilliant colors of irises. There are many articles and books written on this subject, so feel free to "google" it and learn as much as you desire. Our discussion today is simply about the wide range of colors to be found in this group of irises. 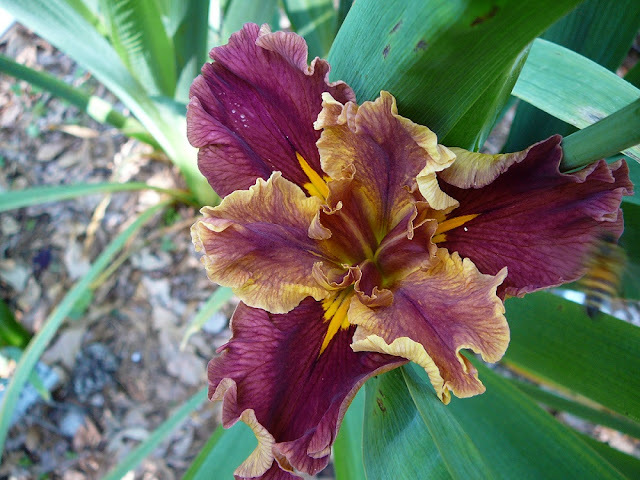 The color range of Louisiana irises had been greatly expanded by more than 75 years of hybridizing. 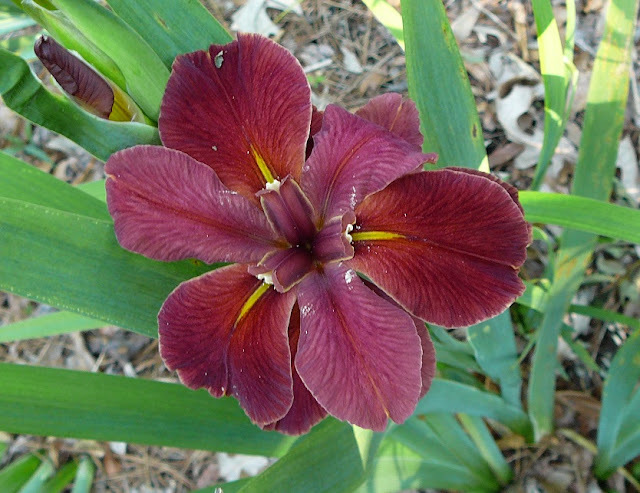 In other postings we have looked at other colors of Louisiana irises, in our search to study the diversity of color found in irises. Now I want to start this discussion with the Louisiana irises that are red or somewhat red. 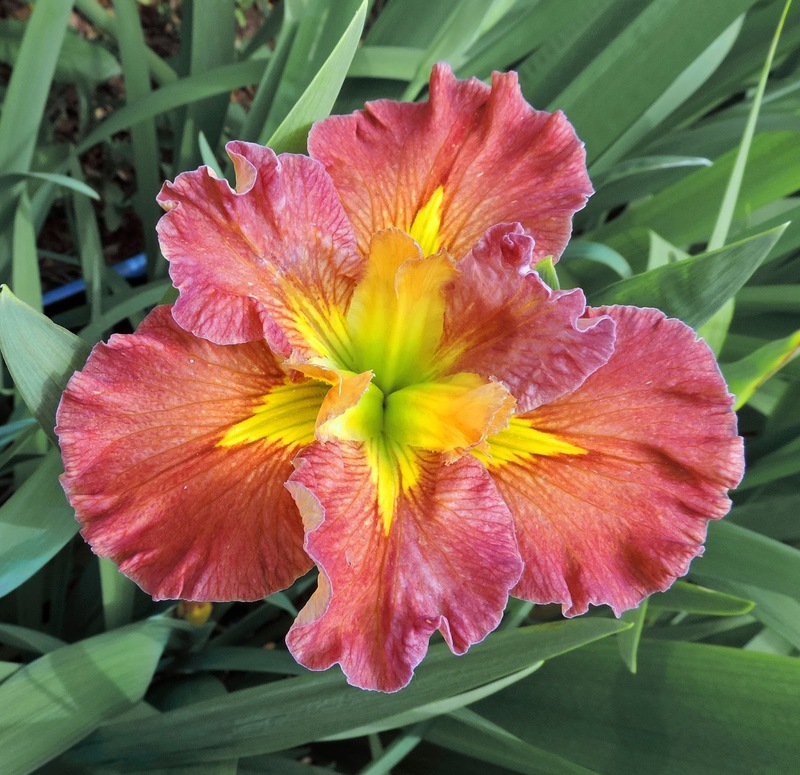 Color is a big subject and from reading the descriptions of irises in various registration documents, it is easy to see that not everyone describes one color the same as someone else. Therefore, if some of the irises shown below are not what you consider red, then just remember that someone else thought it is indeed red! 'Acadian' by S. Conger 1956, is actually registered as rose color. 'Amber Goddess' by Charles Arny 1963, is registered as amber. 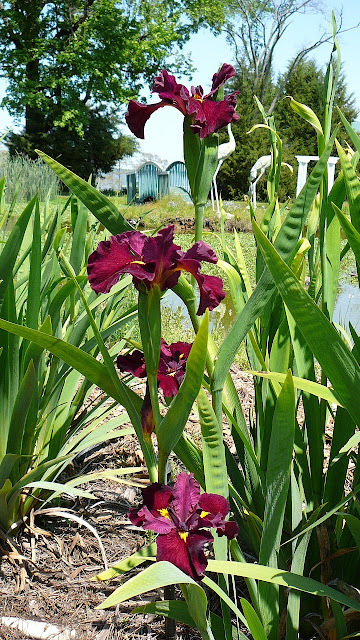 Irises from this period provided the colors needed to expand the diversity of color in Louisiana irises. still has the old flower form like the Sidney Conger iris above. 'Captain Bill' by Sidney Conger, 1956, registered as red (Corinthian red) stands with mauve rose falls. 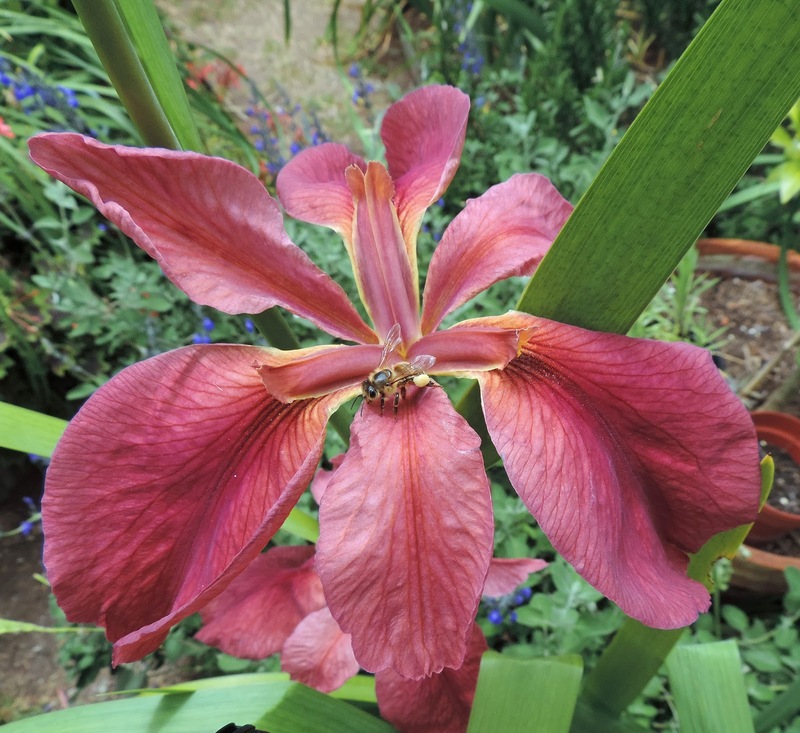 'Chacahoula Fire' by Rusty McSparrin, 2005, registered as orange red but there is much more going on in this iris. Notice the signals are bordered in red. 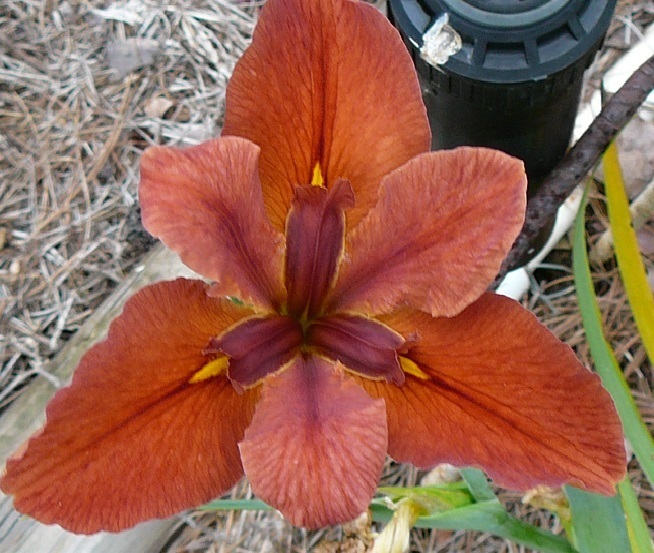 The pod parent was 'Cajun Caper' by MacMilliam in 1975, a violet iris. 'Cherry Cup' by R. Morgan, 1988, is registered as "full red". This picture is really of two irises, one immediately above the one below. Both parents are registered as red. 'Coral Island' by Peter Jackson of Australia, 2017, registered as "coral pink. What a beauty. Such "eye catching" signals and style arms. The pod parent is orange and the pollen parent is "ruby red". 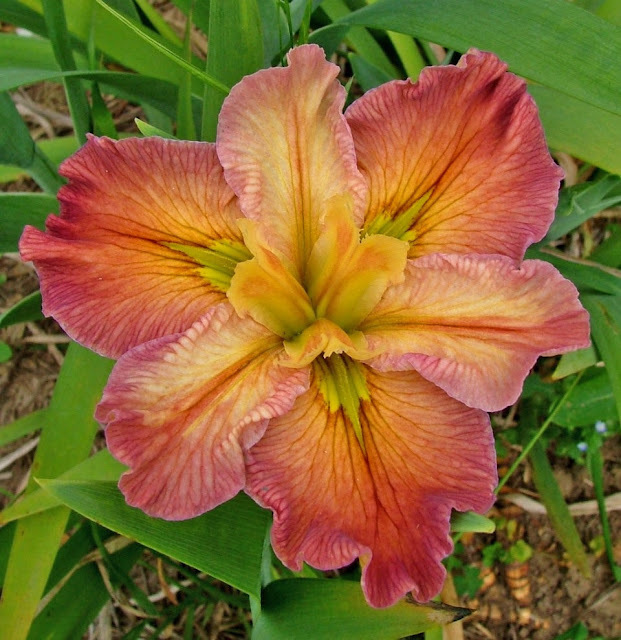 'Exquisite Idea' by Heather Pryor of Australia, 2006, registered as "stands lemon, falls golden yellow" but I see some red in this iris, do you? Also lots of other colors. It is certainly "eye catching". 'Extra Dazzle' by Heather Pryor 2003, registered as "dark cyclamen rose". The registration picture shows more green in the signals, and the next picture, shown below, does show more green in the signals. I do not know if this bloom is older or newer than the one below. 'Extra Dazzle' - a love irises that have an "appropriate" name and this one certainly has extra dazzle. 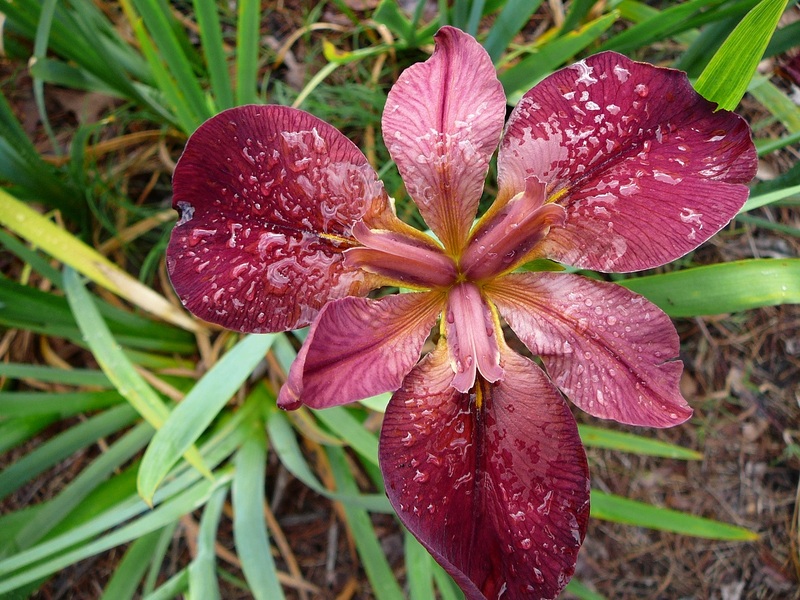 There are not a lot of Louisiana irises with the signal on all petals. I found only one other with his as the pod parent and none with the pollen parent. 'Fire Alarm' by Caroline Dormon in 1951. Registered as "carmine self". 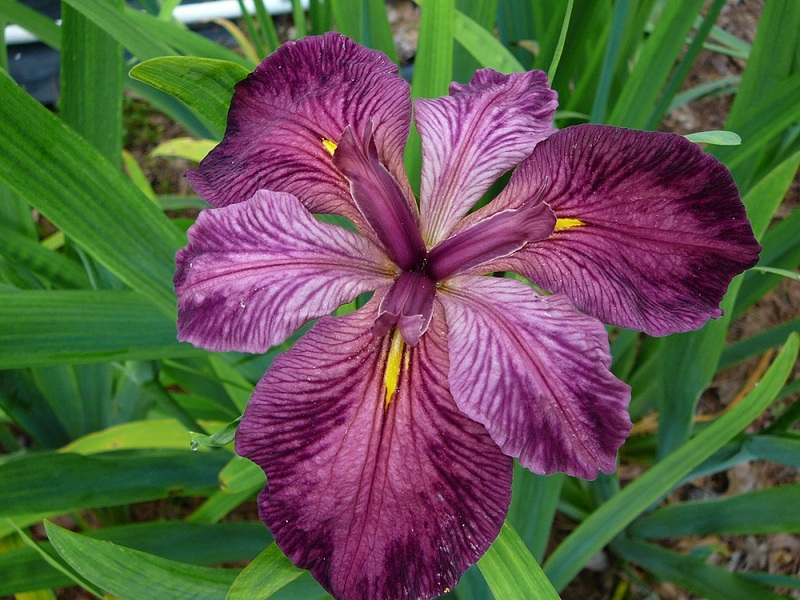 See 'Wheelhorse' below for a similar iris. 'Flaming Hot' by Ron Betzer in 2016, registered as "stands red-orange and falls red-orange". 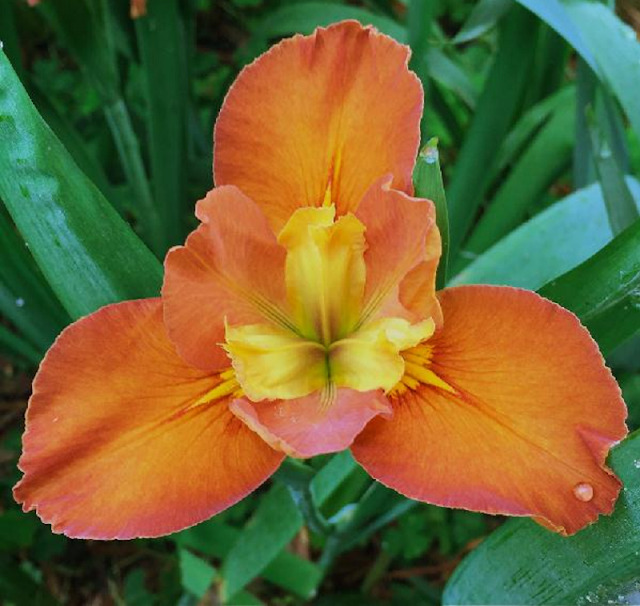 If you have access to the iris registration information, look up the parentage of this iris! 'Flash Harry' by Penny Davis of Australia in 2008. The registration picture looks quite a bit different and talks about "red flush" and "wine red". 'Fringed Gold' by D. L. Shepard in 1992. 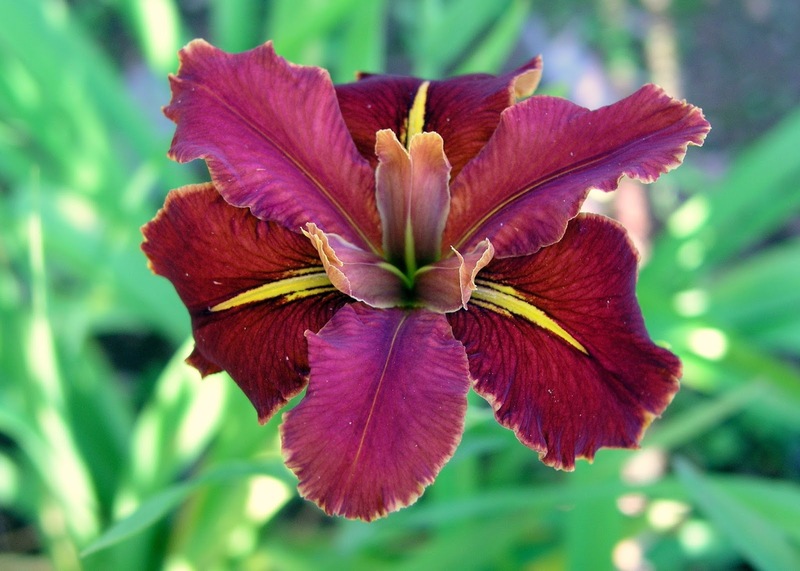 I am often asked to name my "favorite" iris and this one is always in the list of twenty to thirty "favorites". It is registered as "brick red". 'Gladiator's Gift' by John Taylor of Australia in 1990. Registered as "greyed red". Looks red to me. 'Kerry Lynette Douglas' by D. R. Grieves of Australia 2007. Registered as "greyed red" and "rusty red". 'News Brief' by Henry Rowlan 1982, registered as "red" and "chrysanthemum crimson". More red here than the registration picture. 'Our Friend Harry' by Ron Killingsworth, 2011. I had to include at least one of mine, right? Registered as "maroon" but I do not know why -- most men do basic colors and I would have thought I registered this as "red". 'Pointe Aux Chenes' by Joseph Musacchia in 2005. OK, this one is not red but I like it and so here it is! It is registered as "peach" but I see a lot of red in it. The picture below is same iris, different view. 'Pointe Aux Chenes' -- look down into the area in the middle of the style arms and see if you think it has some red. Pointe Aux Chenes is, among other things, a wildlife management area in south Louisiana. 'Professor Neil' by Joseph Mertzweiller 1990. As mentioned above, the tetraploid Louisiana irises, many of them anyway, came from Joe Mertzweiller's work with tetraploids many years back. 'Wheelhorse', described below, was included in the pod parent. I do not know the name of this iris or where I found it. We call them "surprises" around here and they pop up from time to time. Could be a seedling, could simply be a named iris that has lot its identity. I think it is pretty and red. 'Wheelhorse' by Caroline Dormon, 1952, registered as "rose bitone". I found 14 irises with this as the pod parent and 24 with this as the pollen parent. Still a show winner and was one of the irises treated with colchicine by Joseph Mertzweiller in his development of the the tetraploids Louisiana irises, many of which he named for his professor friends, such as 'Professor Marta Marie' (J. Mertzweiller, 1990) and many of them are "redish" in color. To learn more about Louisiana irises, visit here. To learn more about all irises, visit the American Iris Society. Next time we will look at yellow Louisiana irises.